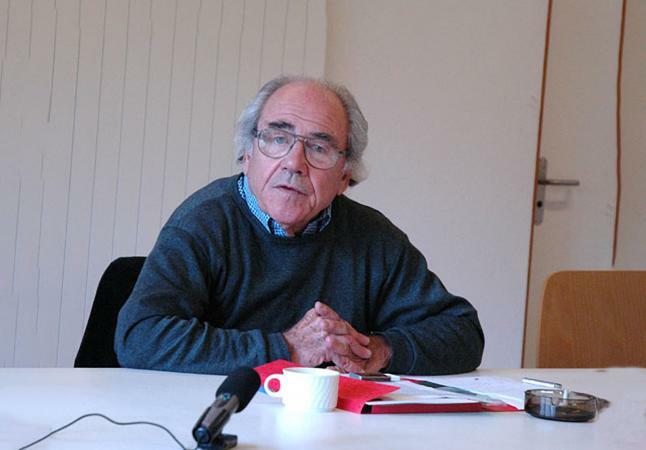 The French intellectual Jean Baudrillard (b. 1929) is widely acclaimed as one of the master visionary thinkers of postmodernism and post-structuralism. He was trained as a sociologist, and his early critique was influenced by a certain style of radicalism that appeared in France after 1968, which included critical challenge to the disciplines, methods, theories, styles, and discourses of the academic intellectual establishment. After the late 1960s Baudrillard's social theory witnessed major paradigm shifts. The theory of consumption that he began to articulate in the 1970s fore-saw the development of consumer society, with its dual focus first on the visual culture (material objects) and, later, on the virtual (electronic and cyberspace) culture. Baudrillard's fashion-relevant theorizing dates from his earlier writing: it forms part of his broader analysis of objects in consumer society. This scheme postulated a transition from "dress," in which sartorial meaning (of differentiation and distinction) resided in natural signs, through "fashion," in which meaning resided in oppositional (structuralist) signs, to "post-fashion," in which signs are freed from the link to referents and to meaning (poststructuralist). 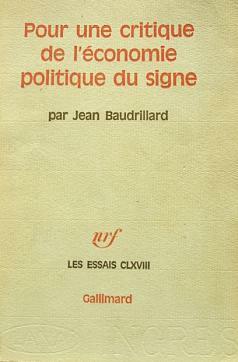 Baudrillard's early work is divided into three phases: (a) the reworking of Marxist social theory, as evident in The System of Objects (1968), The Consumer Society (1970), and For a Critique of the Political Economy of the Sign (1972) and with an emphasis on the "sign"; (b) a critique of Marxism, as seen in The Mirror of Production (1975) and Symbolic Exchange and Death (1976), where Baudrillard substitutes symbolic exchange for utilitarian exchange as an explanation of consumerism; (c) a break with Marxism, as manifest in Seduction (1979), Simulations (1983), Fatal Strategies (1983), and The Transparency of Evil: Essays on Extreme Phenomena (1993), which substitutes the carnival-esque principle (celebration, pleasure, excess, and waste) for the utility principle. Initially, Baudrillard argued that when products move from the realm of function (reflecting use value and exchange value) to the realm of signification (reflecting sign value), they become carriers of social meaning. Specifically, they become "objects." Baudrillard's notion of sign value is based on an analogy between a system of objects (commodity) and a system of sign (language). He applied Ferdinand de Saussure's structural linguistics to the study of fashion, media, ideologies, and images. If consumption is a communication system (messages and images), commodities are no longer defined by their use but by what they signify-not individually but as "set" in a total configuration. The meaning of signs, according to de Saus-sure, is made up of two elements: signifiers (sound images), which index the signifieds (referent). Saussurian structural linguistics is based on two principles: a metaphysics of depth and a metaphysics of surface. The metaphysics of depth assumes that meaning links a signifier with an underlying signified. The metaphysics of surface implies that signs do not have inherent meaning but rather gain their meaning through their relation to other signs. Using a linguistic (semiotic) analogy to analyze commodities, Baudrillard developed a genealogy of sign structures consisting of three orders. The first order, founded on imitation, presupposes a dualism where appearances mask reality. In the second order, founded on production, appearances create an illusion of reality. In the third order, founded on simulation, appearances invent reality. No longer concerned with the real, images are reproduced from a model, and it is this lack of a reference point that threatens the distinction between true and false. There are parallels between Baudrillard's historical theory of sign structures and historical theorizing of European sartorial signification. The order of imitation corresponds to the premodern stage, the order of production corresponds to the modern stage, and the order of simulation corresponds to the postmodern stage. Throughout European fashion history the scarcity of resources symbolized rank in dress. Costly materials were owned and displayed by the privileged classes. Technological and social developments from the fourteenth century onward challenged the rigid hierarchy of feudal society. This challenge triggered the legislation of sumptuary laws that attempted to regulate clothing practices along status lines by defining precisely the type and quality of fabrics allowed to each class. Since styles were not sanctioned by law, toward the end of the fourteenth century clothes began to take on new forms. This tendency set in motion a process of differentiation (along the lines of Georg Simmel's "trickle-down theory" of fashion), whereby the aristocracy could distinguish itself by the speed with which it adopted new styles. The technological developments that characterized industrial capitalism (among them, the invention of the sewing machine and wash-proof dyes), popularized fashion by reducing the price of materials. Mass production of clothes increased homogeneity of style and decreased their indexical function. The industrial revolution created the city and the mass society, improved mobility, and multiplied social roles. A new order was created in which work (achieved status) rather than lineage (ascribed status) determined social positioning. Uniforms were introduced to the workplace to denote rank, as dress no longer reflected rank order (but instead defined time of day, activities, occasions, or gender). As a result, a subtle expert system of status differentiation through appearance between the aristocracy and "new money" evolved. This system coded the minutiae of appearance and attributed symbolic meanings that reflected a person's character or social standing. It also anchored certain sartorial practices to moral values (for example, the notion of noblesse oblige). Postmodernism denotes a radical break with the dominant culture and aesthetics. In architecture it represented plurality of forms, fragmentation of styles, and diffuse boundaries. It has substituted disunity, subjectivity, and ambiguity for the modernist unity, absolutism, and certainty. In the sciences it stands for a "crisis in representation." This challenge to the "correspondence theory of truth" resulted in totalizing theories of universal claims giving way to a plurality of "narrative truths" that reflect, instead, the conventions of discourse (for example, rules of grammar that construct gender, metaphors and expressions encode cultural assumptions and worldview, notions of what makes a "good" story). The postmodern cultural shift has left its mark on the fashion world through its rejection of tradition, relaxation of norms, emphasis on individual diversity, and variability of styles. Baudrillard characterized postmodern fashion by a shift from the modern order of production (functionality and utility) to the aristocratic order of seduction. Seduction derives pleasure from excess (sumptuary useless consumption of surplus, such as is displayed by celebrities). Baudrillard posits seduction as a system that marks the end of the structuralist principle of opposition as a basis for meaning. His notion of seduction is that of a libido that is enigmatic and enchanted. It is not a passion for desire but a passion for games and ritual. Seduction takes place on the level of appearance, surface, and signs and negates the seriousness of reality, meaning, morality, and truth. Analysis of the three stages of sartorial representation in terms of Baudrillard's signification relations produces Figure 1. 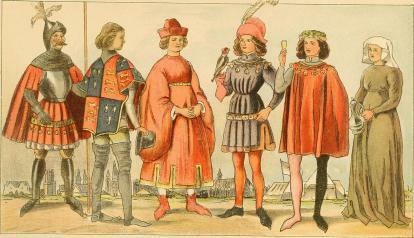 In the order of imitation that characterized the premodern stage, clothes refer unequivocally to status. They signify the natural order of things without ambiguity. The order of production characterized the modern stage, where mass-produced clothes ceased to be indexical of status. It became important to establish whether people were what they claimed to be or rather were just pretending. In the orders of imitation and production, the signifier indexes an underlying meaning, either inherent or constructed. In contrast, the order of simulation refers to the principle of the postmodern dress that is indifferent to any traditional social order and is completely self-referential, that is, fashion for its own sake. For Baudrillard, the effacing of real history as a referent leaves us nothing but empty signs and marks the end of signification itself. In sum, as simulation substitutes for production, it replaces the linear order with a cyclical order and frees the signifier from its link to the signified. Thus, fashion as a form of pleasure takes the place of fashion as a form of communication. See also Walter Benjamin; George (beau) Brummell; Theories of Fashion; Stéphane Mallarmé; Georg Simmel; Oscar Wilde. Jean Baudrillard. The Mirror of Production. Translated by Mark Poster. St. Louis, Mo. : Telos Press, 1975. --. For a Critique of the Political Economy of the Sign. Translated by Charles Levin. St. Louis, Mo. : Telos Press, 1981. --. Simulations. Translated by Paul Foss, Paul Patton, and Philip Beitchman. New York: Semiotext (e), 1983. --. Fatal Strategies. Translated by Philip Beitchman and W. G. J. Niesluchowski. New York: Semiotext (e), 1990. --. Seduction. Translated by Brian Singer. New York: St. Martin's Press, 1990. --. Symbolic Exchange and Death. Translated by Iain Hamilton Grant. Thousand Oaks, Calif.: Sage Publications, 1993. --. The Transparency of Evil: Essays on Extreme Phenomena. Translated by James Benedict. London and New York: Verso, 1993. --. The System of Objects. Translated by James Benedict. New York: Verso, 1996. --. The Consumer Society: Myths and Structures. Thousand Oaks, Calif.: Sage Publications, 1998. Gane, Mike, ed. Jean Baudrillard. 4 vols. Sage Masters of Modern Social Thought. Thousand Oaks, Calif.: Sage Publications, 2000. Kellner, Douglas. "Baudrillard, Semiurgy and Death." Theory, Culture, and Society 4, no. 1 (1987): 125-146. --. Jean Baudrillard: From Marxism to Postmodernism and Beyond. Stanford, Calif.: Stanford University Press, 1989. Kellner, Douglas, ed. Baudrillard: A Critical Reader. Oxford and Cambridge, Mass. : Blackwell, 1989. Poster, Mark, ed. Jean Baudrillard: Selected Writings. Stanford, Calif.: Stanford University Press, 1988.